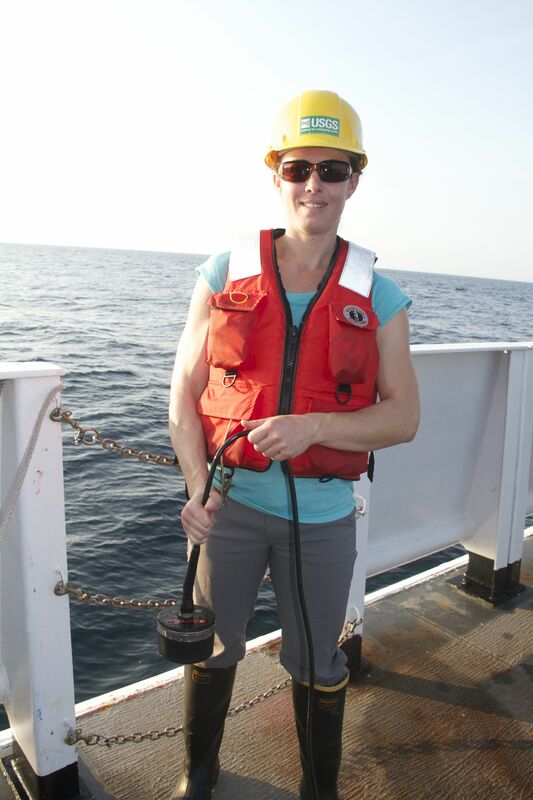 Olivia gets ready to lower the hydrophone in order to ping the lander. 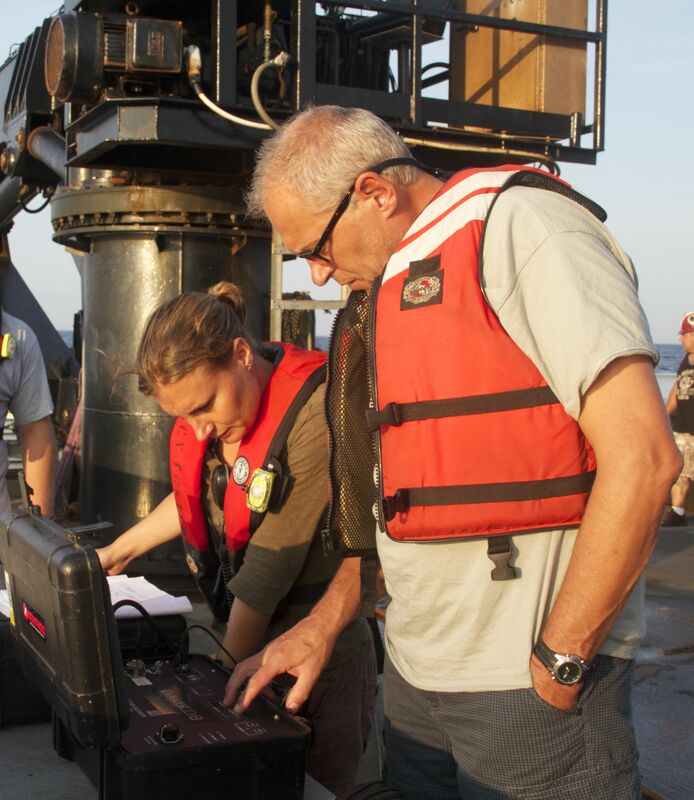 The focus of this cruise was to retrieve four landers we deployed last year in Baltimore and Norfolk Canyons. Two of the landers were from UNCW and two from NIOZ, and they were placed at specific locations so we could collect a year’s worth of data on the physical parameters of the water at the bottom. Currently, three landers are on board. The second lander we tried to recover is still missing, but there is hope. Furu and Gerard sending a “ping” down to try and find the second lander. On Friday, August 23, we sent a ping down to the first NIOZ lander telling it to release its weight. It popped up on the surface and we had it on board within about 40 minutes. We steamed over to the location of the second lander and tried again. This time was a different story. We could hear the landers ping but could not determine a distance from it, which is what we need in order to triangulate its location. We asked it to drop its ballast weight but could not tell if it did so. We spent a long time searching for the lander, and trying to get a response. We knew if it came up to the surface it would begin sending a satellite signal with its latitude and longitude and we would be able to go pick it up. 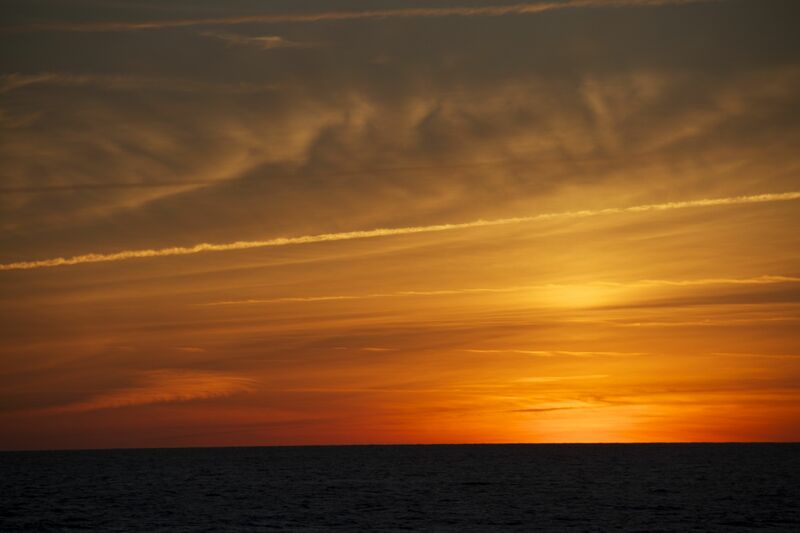 The sun sets as we make our way back to port. was with much disappointment that we watched the beautiful sunset on the starboard side of the ship as our bow pointed south. We began talking about getting a grant to come back later and try to recover it. However, Monday morning Gerard got an update from the satellite transmitter company. They had been able to use some of the signals they had received to determine the location of the lander, and it may be on the surface and drifting towards shore. We are well past its location and can’t turn around to go get it. We have begun working with the ship’s crew and on-shore resources to find a boat that can go retrieve it. Science has a certain amount of risk, and the risk is great when leaving experiments at the bottom of the ocean for a year. But it is worth it. Each lander provides multiple types of high resolution data. This is information we can use to help make wise decisions about how to use our ocean resources. So the landers stay approximately where they were deployed? How much drift to you expect or do they travel? HI Jennifer! The expectation is that the landers will stay where they are deployed and should not drift. This is the reason why we are a bit confused as to where the 2nd lander is. The hope is that another cruise with a ROV will be able to head down and locate the issue as to why the lander did not respond. An earlier lander did come up covered in sediment so the scientists were thinking that perhaps there was a slide of sorts. There are still quite a few things to learn. Thanks for the questions and comments!